Coming around the corner 1 mile in putting myself in USA Team contention. 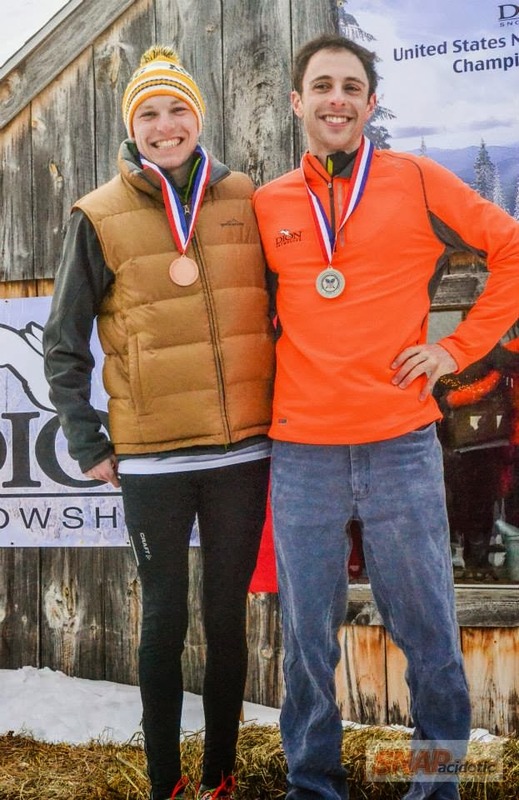 Well the USA Snowshoe Nationals have concluded and I am left with a bitter sweet ending to an interesting snowshoe running season. 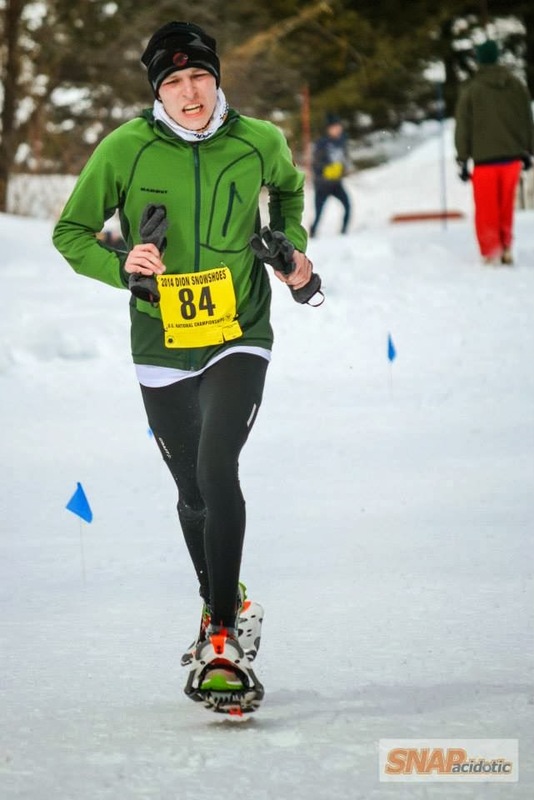 I had the chance to run two races this year the Cockadoodle Shoe and the Highland Forest 10k before Nationals in Bennington. I felt like my form all year was ready to challenge a tough field and show that I can run with the best. What I found out was that on a bad day I could still manage a decent performance after mentally being pretty disappointed. To express the immense quality of the competitors in the field. 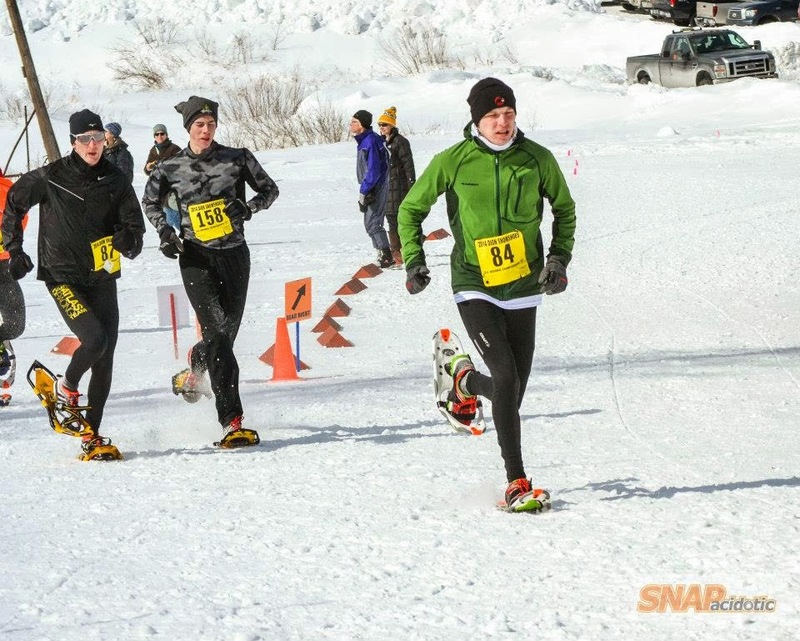 There were runners from Canada, Brazil, Spain, Portugal I think, Sweden and Eric Hartmark and Scott Gall both past members of the US Snowshoe team and true veterans of the sport. 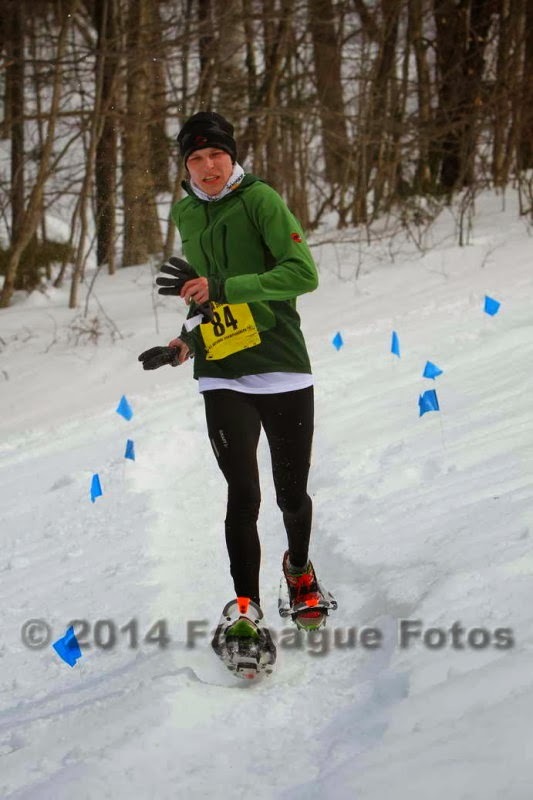 It was truly one of the deepest US fields for snowshoe running on US soil probably of all time. Looking at the course profile with a steady uphill climb the first half of the race followed by a blitzing downhill of 5k madness. I love the downhills especially in snowshoes. The uphill on this day was not my friend and really the course was much harder than the elevation profile on the computer screen. My race strategy to make the team was pretty simple: hang with the leaders until I could not anymore and hope to catch people on the downhill section my strong suit. If I could survive the uphill, then I would be in contention for a team position. Top 5 US make the team. Friday was a blur just trying to get everything in order to head out to Bennington. Once we had the car loaded up, we were on our way to Nationals. We checked into the room at 7:30pm, ate some great pizza and slept for the big day. 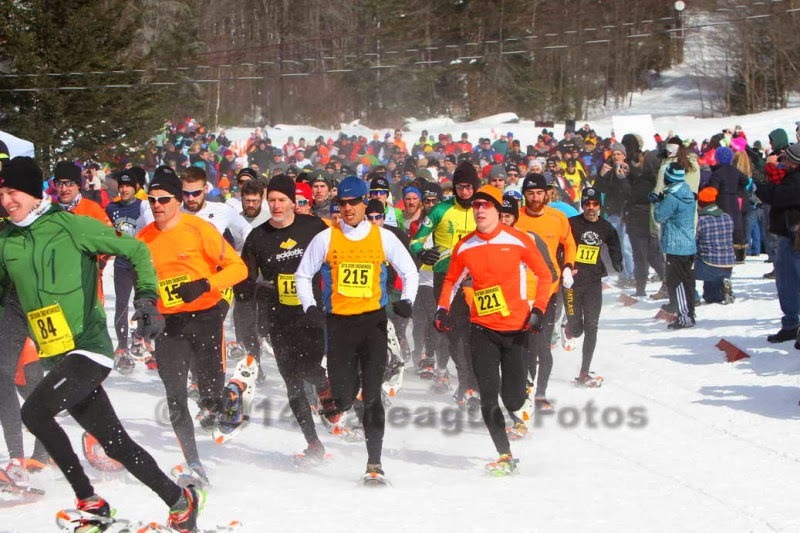 Upon arriving at Prospect Ski Center, it was the most organized and best-looking snowshoe race I have seen around. I felt I was in the alps at some exquisite ski resort. It was great to run into Chris Dunn of Acidotic Racing, Mitch Ryan (SUNY Cortland USA Junior Snowshoe Winner), Jeremy Drowne, Mark Elmore, Jim Johnson, and the list goes on and on. 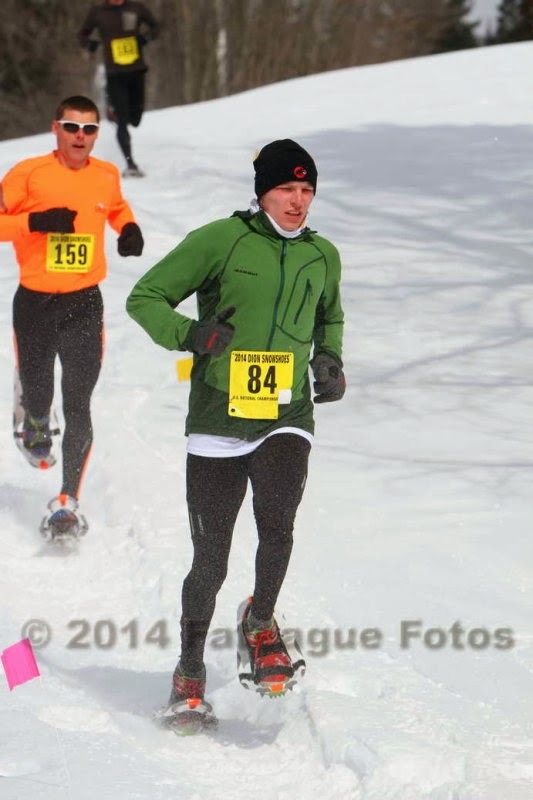 It was great to jog around the course a little before the race to experience the snow conditions which were perfect. 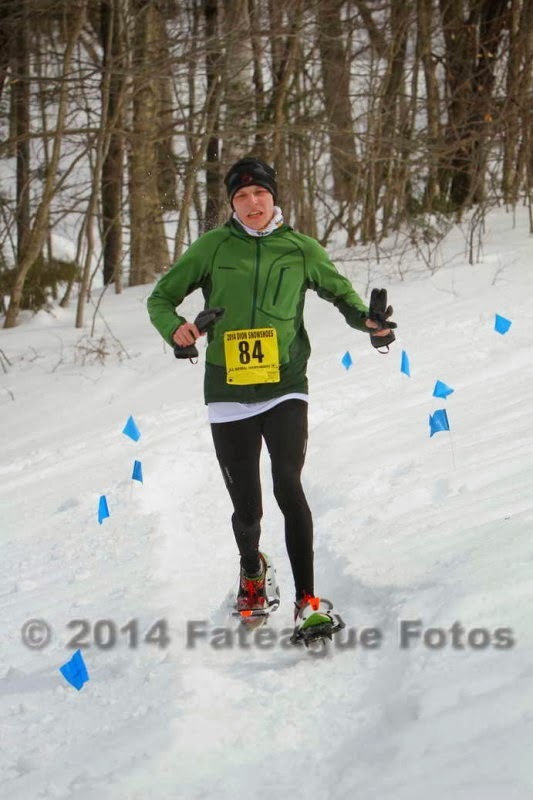 Imagine soft nicely packed snow that made running on snowshoes feel like a road race. The weather was cold in the teens to 20's but the sun was out and made the whole atmosphere of the race feel like a day at the beach. I had the chance to jog a little with Jim Johnson and his crew with Jack Hillenbrand and we all linked up and got to preview the first part of the course which I had no idea what the course would be like up until that point. It was great to touch base with so many great people that running has given me the opportunity to share life with. After the warm-up, it was time to get serious. With an 11:30 start, I had to snack on a yummy nutrition bar and make sure that my energy stores were all ready to go. It was going to be a great race and I was really feeling pretty good after a long and hectic week. Thank you Brian Teague for some awesome photos of the race event! We began to run our strides and prepare for the start. Once everyone was lined up, it was GO TIME. From the gun, the lead group got out to a pretty solid start. The course would begin with a stadium loop on the flat nordic trail sections then loop up a short ski hill and then loop back around onto the single track and main sections of the course. Remember: this course climbs for almost 5k so the whole first mile or so was pretty flat. I settled in the gap right behind the lead group led by those fast TSL athletes from Canada. I remained relaxed and began to prepare myself for the uphill section. Coming into the single track I was maybe 7th overall and kept my position with Quednow of WI a US Team member and a Dion Runner who also made the USA team. We kept pace together as we merged onto the first section of the climb. At moments one would get a little ahead, and then at moments we would all be together. I held my own with my legs beginning to tighten up as we powered up the climb. The pace from the flats to the uphill almost felt like it did not change. The lead group was starting to head out of eyes sight as they picked it up BIG TIME. The two runners I was with kept on the gas as I began to tire. My legs just felt like lead. I kept trying to ratchet the fast uphill pace but I soon lost Quednow and the Dion runner as they began to pull ahead by about 3 seconds. I looked behind me and could see the long line of runner's fighting for a National team spot. It was by the 3k point now as I knew that I may not have it in the legs to make the team this year. If only I could hold my position until the downhill. ****On the day, the strategy of hanging with the lead pack as they relentlessly pounded the steep 4k uphill section left my legs in a world of pain. I knew at about 3k into the race as I was passed by the first two people that I would not be making the National team this year. After the first two, came another two, and some were runners I have beaten in snowshoe races this year or individuals that I know that I often have better days than on average. That was hard. Watching yourself get passed by people you have run faster than blow by you on an uphill. I power hiked for a section feeling sorry for myself as more runners began to pace me. I felt defeated and dejected. By 5k, I was out of contention and who knows maybe like 30th place. It is always a hard thing to feel as if I was powerless. My legs felt so flat on the hill and though I have been braving the snowy conditions this winter, I do not think I trained with this type of climbing in mind. My body was tired and even more strained from such a consistent 8% grade which on a road would not seem as bad as running on those snowshoes. I began to allow my mind to float into thought of how I would have prepared differently for the race and harping on how as simply as 2k of a race, I was out of contention. The last two people to pass me near the top of the climb was Jeremy Drowne and Matt Medieros both runners I have come to friend at the Cockadoodle shoe 10k in Saranac, NY. At this moment, the views of the adjacent mountains was spectacular. I took a second to relax and at this point just enjoy the experience. I fought hard to close and catch-up to Jeremy and Matt. With them having a 5-10 second lead on me into the downhill single track, I began to become alive. It was as if I was a completely different person. My suffering quads began to respond as I flew down the trail. I was closing really well. The 5-10 second gap in a matter of seconds had me right with Matt and Jeremy. It was the three of us running together which was really a highlight of the race for me. 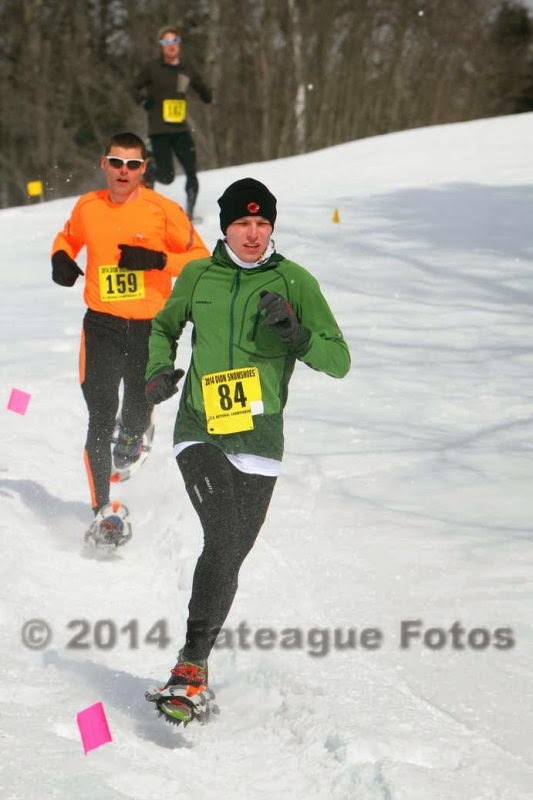 Here I was running with two great guys both friends through snowshoe running and we were working together like a team. I settled behind and remained relaxed. On the single track and nordic sections, we all remained together with Jeremy at the helm. Once the trail opened up, I blew past Matt ready to give it all I had. I began to flow downhill the way that I have practiced in snowshoes and felt great. With a first 5k probably near 27-29 minutes, my second 5k had to be one of the fastest of the day. I am certain I split on sections close to sub 6 minutes a mile. As I passed Jeremy he told me to "GO get em" which was great encouragement. I flew down the hill and could see Eric Sambolec who is a great Nationals runner always peaking when needed and I had my sights for him. He was a ways away but I began to reel him in. I was getting hot and took my gloves off and clenched them with the feeling of being on the hunt. I closed to under a minute from a couple minutes which is amazing given the whole last 5k was downhill. I hit the open switchbacks knowing I had not run the way I had hoped for but was proud of my new-found energy sprinting the switchbacks and onto the last 400m around the field. I kicked it in with reckless abandon and crossed the line 18th overall and 14th American in 47:38 about 20 seconds behind Sambolec. That in itself being about 2-3 minutes behind in the downhill to close within 20 seconds shows the way I tackled that challenge. It was an incredible experience running such a two-sided race. The uphill, I was a struggling, young, complacent and weak runner and on the downhill, I was an aggressive, smart, tactical, professional. 1. Rolling hill courses are my forte-I do not have the quad-crushing strength yet to charge uphill for an extended amount of time. I manage uphills really well. The more that you have an up and down and up and down format, the better I excel. 2. Needed to run up long climbs in snowshoes-I could have simulated the course at Cortland's Greek Peak Ski Resort with its miles upon miles of forest access roads that climb forever. I hope to integrate this next year. 3. Trying to do Too MUCH--Trying to finish Graduate School and line-up an internship and career job and clean the house and I said too much. 4. Go out slower--I saw so many great performances from those that went out slow so that they could charge the uphill and run on fumes on the downhill. 5. Do Not Give Up---I mentally threw in the towel early but in a top race be confident in your abilities. 6. Have Fun--It was not until the last 5k that I truly let go and had a blast and I think I ran that second half well because of my positive attitude. ****Thank you to my sponsors: Mammut, Acidotic Racing, Dion Snowshoes, Fits Socks, Craft/Karhu, and my awesome family for all the support and love. You make it happen so thank you! Here are the photos sights and sounds of the USA 2014 Dion Snowshoes National Championships. 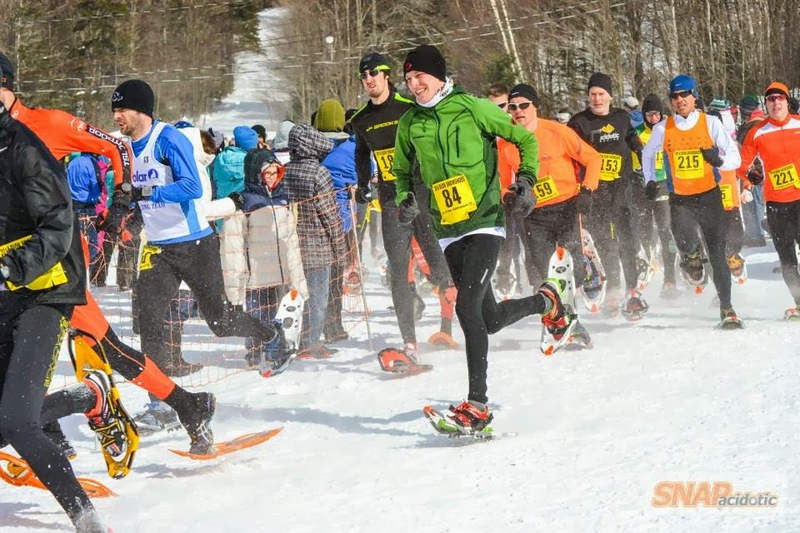 Thank you Mark Elmore for being the leader of USA Snowshoe running, Bob Dion for your brand support for the sport and Tim Van Orden for designing a really tough and rewarding course. Next year, Nationals is in Eau Claire, Wisconsin and I hope the course will be a roller. Looking at the geography of the area, I am really pumped to get ready for a race that will be probably more of a Cole Crosby type of course. Now, if the snow were to melt tomorrow, I would not be sad. Come on Spring! Thank you SnapAcidotic For the best photos around!!!!! This picture embodies the race. I suffered on the uphill but gave it all I had on the downhill. A disappointment not to make the team, but I can shoot for a spot next year and train much harder on snowshoes for it! Myself and Nick Scalfone of California getting Age Group Medals!